All right, so I'm breaking two of his rules (or preferences) right off the bat. The book I'm talking about today was not found in a book or thrift store and it isn't a particularly weird one, unless you consider systemic racism and religion weird (which, like, fair enough). I stumbled across a paperback copy of Go Tell It on the Mountain at a neighborhood tag sale a few weeks back. My boyfriend and I were on a walk when we noticed a handwritten sign advertising the sale and decided to check it out. When we arrived, we were surprised to find it was hosted by none other than a few of our favorite bartenders from a bar/restaurant we frequent downtown. One of the bartenders was moving to France and getting rid of his things, which just happened to include a smattering of awesome books. I picked up The Fire Next Time (because it's important and amazing) and Go Tell It on the Mountain, and my boyfriend grabbed The Female Gaze: Women as Viewers of Popular Culture (because he's also amazing). 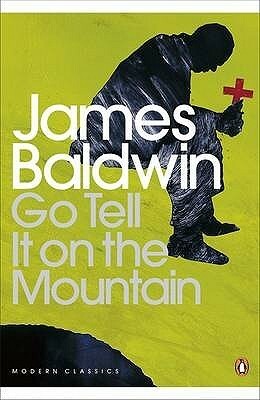 All told, we spent $9 on three books, bringing my total for Go Tell It on the Mountain to a paltry $3. A classic, semi-autobiographical novel about the role of the church in black American identity, all for less than the cost of a latte? I'll take it. Also, it comes with the added bonus of being one of my Classics Club reads! Have you made any particularly awesome or strange (and cheap!) book buys in the last week or so? Be sure to write about it and link up over at Motion Sick Lit! Thanks again to Sal for hosting this awesomeness. *And, by party time, I mean reading books, drinking tea, and probably discussing feminism. His family is the best. Thanks for taking part! Really, the only requirement is that it's purchased secondhand. Giving money to independent business is great, but saving a book from the landfill is just as good, so no worries there. I figure strange/weird is out of the comfort zone of most people, so I was just trying to encourage folks to try something new..the books don't have to break the comfort zone...the Nicole Krauss ones I picked up sure don't. Still, always great to grab interesting books on the cheap. Hope you like 'em! Looks like you got multiple birds with one stone--the meme, the Classic Clubs, some good books on the cheap, and quality time with you s/o. Sounds like a good Thrifty Thursday to me. Sounds like a pretty perfect happy accident! I still haven't read James Baldwin, but I have a copy of Another Country I've been meaning to get to forever. I'll just keep hoping I stumble upon random book sales in my neighborhood, too. Reading books, drinking tea and discussing feminism sounds lovely to me! Oh, it was! She's such a lovely person. It really was! I wish you lots of luck in finding those random books. :) You said you've got some Little Free Libraries in your neighborhood, right? Do you ever strike gold there? You're welcome! It's a really fun feature and a great way to get people thinking about where they're getting their books.